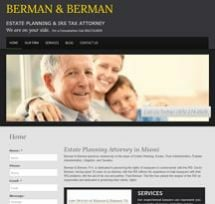 Based in Miami-but far enough away from downtown for an easy ride-Berman & Berman, P.A. is an estate planning, probate administration and tax law firm known for its exceptional client service. Our lead attorneys, the father and son team of David and Paul Berman, offer compassionate advocacy and sound counsel to families facing difficult legal issues and decisions. At our firm, we understand why lawyers get a bad reputation and we're committed to avoiding all the big firm nonsense. Whether you need assistance drafting an estate plan, administering probate or resolving a tax issue, Paul and Grandpa David can minimize your family's hardship and help get you on the right track. To let our family help yours, contact our trusted firm via email or call 305-274-7829. Life is short. You should spend it enjoying your family and friends, not worried about legal troubles. No one understands that better than Paul and Grandpa David-and we want to help you get back to what matters most. At our small, father-son firm, we want to get to know you and your family. Every family has a unique experience and set of goals, and we are dedicated to working closely alongside you to understand and accomplish those. Give yourself and your family the peace of mind you deserve-hire the respected, multilingual attorneys at Berman & Berman, P.A. to settle your legal issues and help you get back to enjoying your life. Contact our firm online or call us at 305-274-7829.